As one of the world’s largest travel agency groups, Flight Centre offers the reliable service and trusted brand recognition that comes with more than 2,000 leisure, corporate and wholesale businesses in 11 different countries. 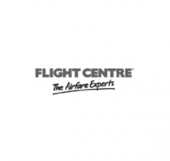 Flight Centre is committed to providing great travel experiences at the best available price. Our highly trained team of expert consultants can assist with all aspects of travel flights, hotels, car hire, cruises, travel insurance, tours, visas, travel money cards, frequent flyer programs and more while providing expert recommendations and 24/7 emergency coverage no matter where you are in the world.